SolidWorks World 2009 in coming to Orlando next week and I’m preparing to blog about this. And, yes… I’d like to start a discussion about how the SolidWorks community is ready for PLM. Compared to many SolidWorks visualization tools, many customers find PLM and anything to do with data management just plain booooring… But if you take another minute and think about it a bit more, you might think differently… We are in an economical downturn. This is a perfect time to show some additional areas of focus rather than concentrating only on the newest and latest set of SolidWorks features. That’ s not to say that features aren’t interesting – I am sure they are all great and will be perfectly delivered by my colleagues from DS SolidWorks Corp. What I am saying is that this is an opportunity to leave features alone for a bit, and speak more about PLM. PLM can help you practically to get better control over the cost of the products you design and manufacture. I’m sure that you know that 80% of the product cost is defined during the design phase. You can establish the right environment in which you control design, engineering and manufacturing information at the same time in the PLM system. This is possible by supporting Item Masters and multiple Bill of Materials. 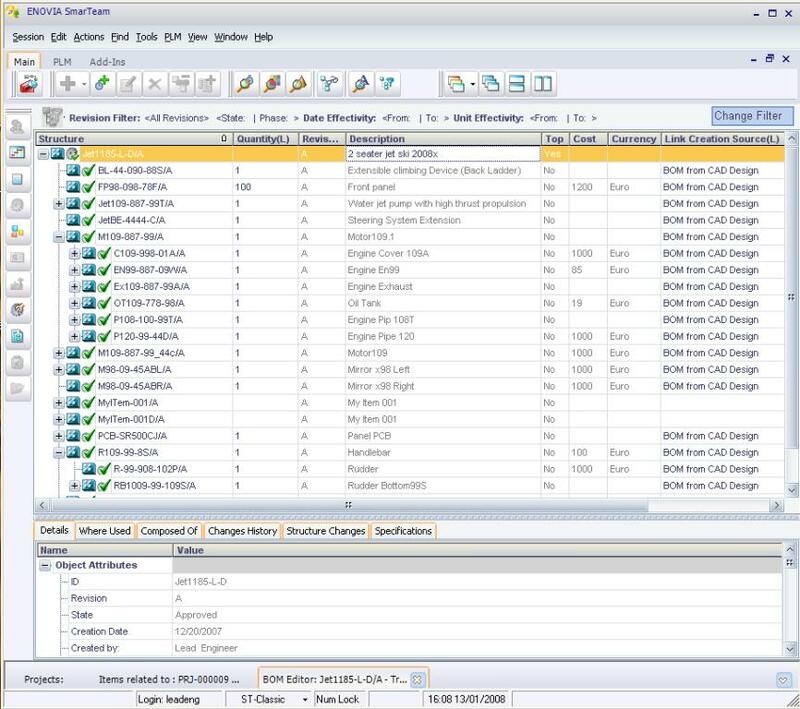 As soon as you will be able to produce an engineering and manufacturing BOM, and visually compare and synchronize changes, you will be able to optimize your product cost during the design time, since you will already be taking manufacturing and supply chain information into consideration. Imagine that you can access the engineering and manufacturing Bill of Materials directly from your SolidWorks environment, collaborate together with manufacturing planning engineers on the same Bill of Material structure, and optimize your changes together. PLM tools will allow you to work in cycles together with your engineering and manufacturing colleagues. At the end of the design phase, you will have a “ready for production” Bill of Materials. You will be able to get rid of all the excel spreadsheets you are using today to produce multiple Bill of Materials. These will be replaced with tools integrated into SolidWorks. 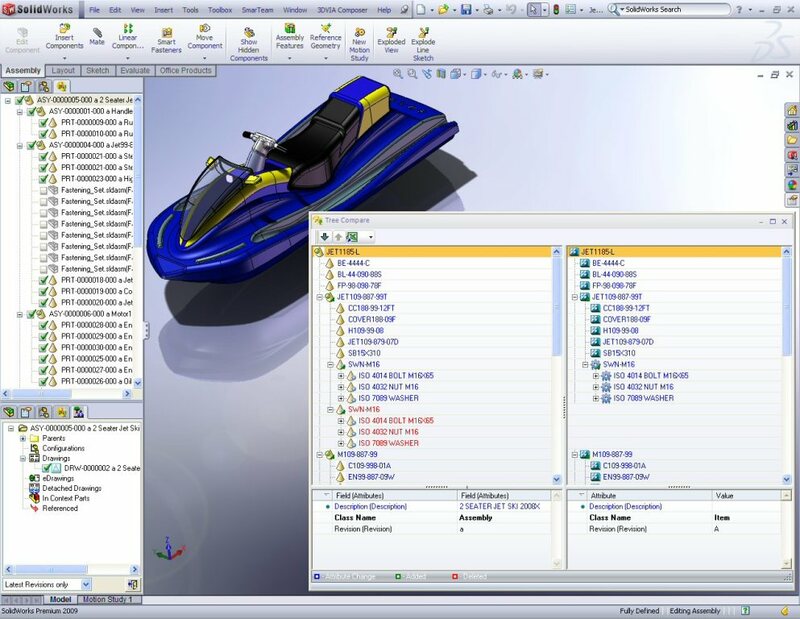 You can see some examples of SmarTeam PLM interfaces with SolidWorks bellow. Compare Design to Manufacturing Bill of Material in SolidWorks. I hope this has sparked your. I will keep blogging on these topics during the next week, live from SolidWorks World, and look forward to seeing you all next week in Orlando. Let’s keep our fingers crossed for good weather (compared to what I’ve been experiencing lately in Boston, Mass :)). Vuuch will be showing some more than features. We will be showing a brand new approach to design discussions. Stop by and give it a look. I will be glad to see more vuuch features next week in Orlando. In my view, Excel works just because people have trust in content they put in Excel. People assumes it’s easy to put and easy to get back. This is from people’s standpoint Excel reliability. And this is simple. I think our approach with multiple BOMs can provide significant advantages over Excel in the way it can manage connected product information. I’d like to know if people are thinking about designing the supply chain as they’re thinking about PLM. Common thinking is to use Low Cost Country Sourcing to reduce component cost, but transportation and inventory costs may chew up the savings. Analysis of multiple BOM’s are often the starting point building a supply strategy for a new product introductions or a product phase-out. Gary, I agree with your point. I think work around BOM in supply chain and optimization can help in taking decision with regards to Low Cost Countries. -Oleg.